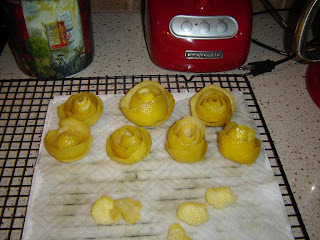 Before I start with my Lemon Luxury Cake tale, let me begin by telling you about the lemon roses. I made them a couple of weekends ago. I bought over half a dozen of lemons. I've never made this before and I was afraid I'd fail. 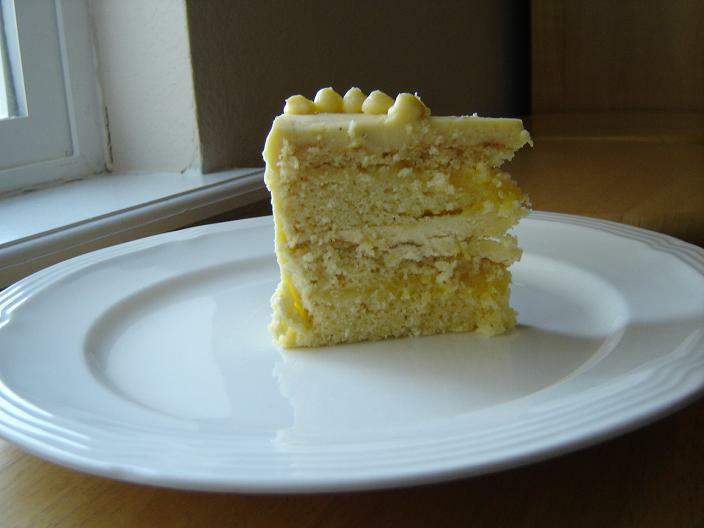 The recipe (on page 432 of Heavenly Cakes) tells you to peel the skin of the lemon with a paring knife. I don't understand what Rose meant by "start by cutting a round section across the base of the fruit but not all the way through," but I figured since I have so many lemons I should just start peeling. Then I boil sugar syrup, add the peel to the simmering syrup, cover the pan, remove from the heat, and let sit overnight. The next morning, remove the peel from the syrup to paper towels. I wasn't sure whether I should let it sit in the paper towel first until dried before moving on to the next step. So I went ahead anyway, curling each strip loosely around itself to form a rose. Then I let them dry for 1 hour. Then coat all sides of the peel with corn syrup. After 1 hour, apply a second coat, and then another coat after another hour. Oops, as I'm reading the recipe now I realize I made a mistake. It said here that after all those 3 coats of corn syrup, to allow the peel to dry completely which can take several days before storing in covered container. I missed this step. After a couple of hours of the third coat, I store it in a container and put it in the freezer. No wonder my lemon roses looks a bit different than the picture in the book. It is still pretty though, :). 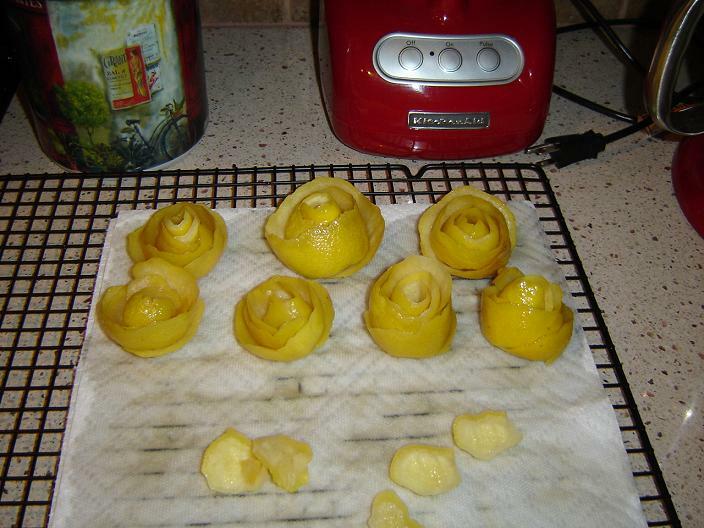 This is the picture of the lemon roses before the corn syrup applications. Moving on to the cake. For once, I would not say that this is an easy cake to make. The recipe itself is four pages long. This is a big cake, so I decided to make it in 6-inch pans. 6-inch pan by volume is not exactly half of 9-inch pan, but when I did the math it comes up to 0.44 so for easiness' sake I divided everything by half. First I made the lemon curd. I whisk the yolks, sugar, and butter until blended, then add the lemon juice and salt. Cook over medium-low heat, stirring constantly. It takes a good 10-15 minutes before the mixture start turning opaque and yellow. I felt like I was stirring and stirring for the longest time. Then it takes another 10 minutes or so before it starts thickening. I must confess that I was really tempted to increase the heat but I didn't want it to curdle. Next I made the white chocolate custard base. This calls for melting white chocolate and butter on a double boiler while stirring often. Then whisk the eggs lightly and then whisk it into the white chocolate mixture. Then continue mixing while heating it up until 140 degrees. I then switched gears to composing the cake. Again, I substituted the cake flour with unbleached AP flour. I melted the white chocolate, then mix the butter, 2/3 of the milk with all the dry ingredients. Then incorporate the egg and 1/3 milk mixture. Then incorporate the white chocolate. Then bake the cake for 35 minutes. Everything went on swimmingly until I took the cake out of the pan and they look like this! I put the lighter cake back to the oven and bake for another 5 minutes. It's done in the center but the top still has the light color. By the time I flip the cake out of the pan, it fell apart and taste odd. The other cake was fine, it was a bit dense - because I used the unbleached AP but it tasted okay. I could not figure out what went wrong with the other cake. I baked the cake on the 3rd rack from the bottom, on the same rack, I rotated the pan halfway through baking. I didn't open the oven door until 5 minutes at the end. I re-read the recipe 5 times and determined that I didn't not messed anything up. Using unbleached AP instead of cake flour would impact structure and texture but it should not impact taste - that is my understanding at least. Frustrated and confused, I gave up for the day and decided to redo the cake the next day.Day 2 of Lemon Cake adventure. I was sad and frustrated but determined to make the cake. This time I use cake flour. Everything went on swimmingly again, and when it's time to incorporate the melted white chocolate into the batter, I let it mix longer just to make sure. The cake baked for 35 minutes again but one of them sunk a little bit in the center and the other one sunk a lot on one side. To make matters worse, there is a big height difference! 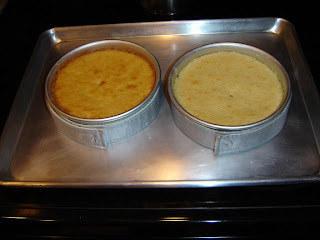 I weigh the batter when I distributed them between the 2 pans and they were both 301 grams. Argh... At this point, I was really frustrated. Though sadly thinking that of course the cake that I requested would be the one that gives me the biggest challenge. Back to the buttercream. I cream the butter, then added the white chocolate custard base and mix until it achieved stiff peak. I didn't want to wait 1 1/2 - 2 hours so I chilled it for a few minutes in an ice bath. The buttercream came together nicely without any issue. Lastly, composing the cake. I tried to make up for the sunken center and inconsistent sides with the buttercream. I know it will look funny when the cake is cut but I really want the exterior of the cake to look good and even. After 3 hours of numerous chilling/freezing the cake and using both bench scraper and heated offset spatula to smooth out the sides, here is the cake with a lemon rose in the center. It is as smooth as I could get it to be. In retrospect, it is probably overkill to spend 3 hours composing the cake but I am very happy with the result. Onto tasting. This cake is really good. It is rich though, I wonder if it's because of all those egg yolks! I would definitely make this cake again, but probably for special occassions since it does take some time and effort (and patience :)). Great job! Your frosting is so smooth!! Do you think you might have a cold spot in your oven? I also used unbleached AP and they came out pretty good. Hi Jennifer, thanks! I rotated the pan halfway through baking. Plus I have a baking stone in there so it keeps the temperature more constant. Love your final product! Looks awesome. Good heavens you did the roses too! I love the roses, and your decorated cake looks beautiful! 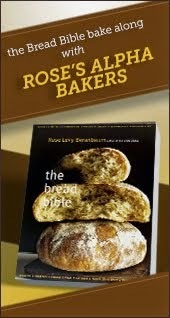 A mystery about what happened to the second layer, though--Rose says there's always an answer to every problem, and there are no real mysteries in baking, but this seems pretty mysterious to me. This is adorable! Perfect for a tea party. I agree the cake was the hardest part of this recipe. Good for you for persevering. Great job Jenn, the cake looks lovely... I love the roses... I was going to do them too but just ran out of time. Funny, there seemed to be a few issues with the cake portion on this one! 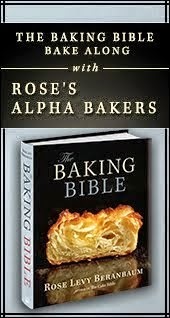 I admire your dedication in baking it twice! 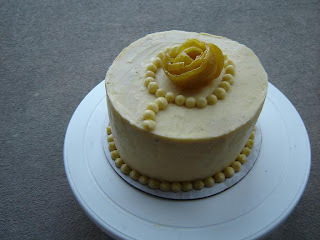 i am sorry you had trouble with this cake, but you went the extra mile with the lemon roses, and your final cake looks adorable. Your cake looks so good, yummmm. I specially love your roses. Cheers to you for sticking it out. I'm not participating but I love to see what you all are doing. Vacation. Be back later, :).